I spent far too many early mornings trekking through the woods without being able to get a decent vantage point for good shots when I was deer hunting. I finally decided it was time for me to invest in a good tree stand that would give me a better view of the woods. After reading several tree stand reviews, I decided that the Summit Viper SD would be the best option for me. Before you go to your nearest outdoor retailer and buy a tree stand, there are some things you should know and consider. Safety:- First and foremost, safety and weight limits are going to be your biggest concern. Far too many people have gotten hurt by falling out of trees, and many injuries are very serious. 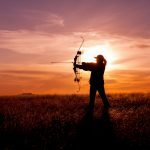 You will want to make sure that the stand is durable enough to hold you and your equipment, and it should be sturdy enough to last several hunting seasons. Every component of the stand should make you feel safe and secure at all times. 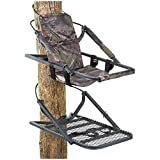 Comfort:- You will likely be spending a lot of time sitting in your tree stand before you finally see any wildlife, so you will want to make sure that the seat and other components are comfortable to you. There is often a tradeoff between portability and comfortability, so you will need to find the balance that is right for you. 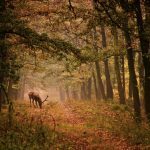 You will just want to keep in mind that if you have an extremely comfortable stand, you’re going to have a lot more opportunities to see and shoot wildlife. If you would rather have a tree stand that is easier to move around from tree to tree, you’re going to have to give up some comfort and probably more time in the trees. The Summit Viper SD tree stand is the most popular Summit tree stand. Summit claims that this tree stand will serve its purpose for several seasons due to its sturdy, yet surprisingly lightweight, frame. 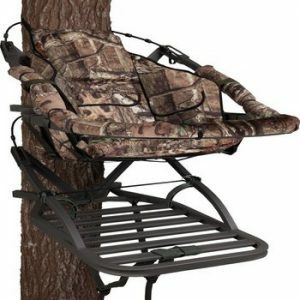 You will find a high level of comfort and functionality in this versatile tree stand. When you buy a Viper tree stand, you get everything that you will need to start hunting from it, including safety straps and harnesses, all hardware, and a safety and instructional video. Compared to other tree stands on the market, the Summit Viper is one of the lightest yet durable options, and it is available for a fairly reasonable price. The Viper SD weighs just 20 pounds, but it can hold up to 300 pounds. 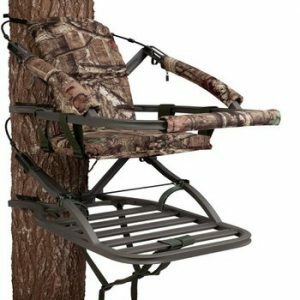 If you are planning to spend long hours sitting in a tree stand, you will love the comfort of this particular model. However, you will want to stick to hunting from blinds if you think that you might not feel safe enough in this tree stand. Aside from all of the pros I’ve mentioned, Summit climbing tree stands feature a lot of brand specific benefits from a sound-deadener to unique joint welds. Each of these features helps to set the Summit Viper apart from other climbing tree stands. DEADMETAL™ Sound-Deadening Technology:- The Deadmetal™ sound-deadening technology that Summit has perfected for the Summit Viper tree stand is an often overlooked feature. However, all hunters know the frustration of missing out on the buck of a lifetime when a squeaky tree stand prevents you from getting your gun or bow ready for the shot. To prevent these frustrations, Summit has created this technology that fills every critical point on the tree stand’s platform with a foam they have custom-engineered to reduce any unwanted noise. QUICKDRAW® Cable Retention System:- Cables are crucial to your safety when you are climbing up and seated in your tree stand. The cables are responsible for keeping the tree stand in place, which is something you don’t want to have to worry about when you are dealing with loaded weapons. Summit claims to have created not only the fastest and simplest cable attachment system, but they also claim that it is the quietest cable system ever invented. 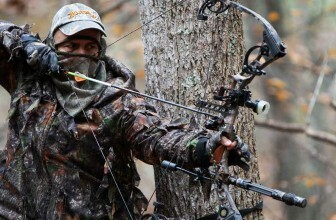 Again, any good hunter knows the importance of keeping quiet when out in the woods. With this cable attachment system, you will no longer have to worry about struggling or dropping pins, knobs, nuts, or any other attachments. All you have to do is make sure the cable is sized to fit the tree’s diameter, and when you insert the cable into the retention bracket, the retention system will lock it in place. When you are ready to remove the stand, you simply pull the trigger to release the cable. SUMMITLOKT® Structural Enhancement:- Part of what makes this tree stand such a great option is the durability. You will always want to have the most durable and structurally sound tree stand, so you can safely use the stand for seasons to come. Summit has developed a unique way of constructing the frame of the tree stand. They use high-quality materials and precise welds to ensure that the frame is strong and rigid. Wherever there is a joint in the build, Summit creates a lock on the joints before they begin welding. This puts less stress on the welds and makes a strong, safe, and silent tree stand. Of course, there are several other climbing trees stands you may want to consider before you purchase the Summit Viper SD tree stand. o, but it also has some distinct differences. The Summit 180 Max SD is another climbing tree stand, but it weighs slightly more than the Viper. It also holds more weight than the Viper, and it comes at a considerably higher price. If you are in need of a tree stand that is on the same level as the Viper in terms of comfort and quality with the ability to hold more weight, then the Summit 180 Max SD is a great option for you. If you are more interested in Summit’s other quality options, you should check out the Summit 180 Max SD. The Lone Wolf tree stand is a combination of a sit and climbing tree stand. It also holds more weight than the Summit Viper despite weighing the same amount. You will also find that this option is almost twic e the price of the Summit Viper SD. This is a great option for someone who wants the versatility of having a combination stand. If you think you would prefer this option over the Viper SD climbing stand, you should check it out. This climbing tree stand is less than half the price of the Summit Viper SD, but for the price, it is a very durable and trustworthy tree stand. It is also made out of steel as opposed to the aluminium Viper, so it is quite a bit heavier. If you don’t mind a heavier tree stand for a lower price, this is a great option for you. It is also great for an yone interested in testing the waters with tree stands because you will get a safe tree stand without spending a lot of money. 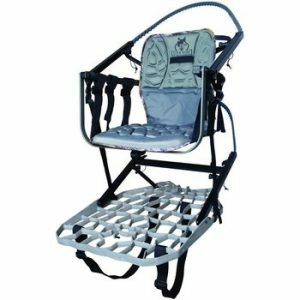 If you are interested in a more affordable option, I encourage you to go check out the Guide Gear Extreme Deluxe Tree Climber. After you buy a Viper SD stand, you will be able to take to perch yourself in any tree and get the perfect vantage point over any awesome buck or other wild game. 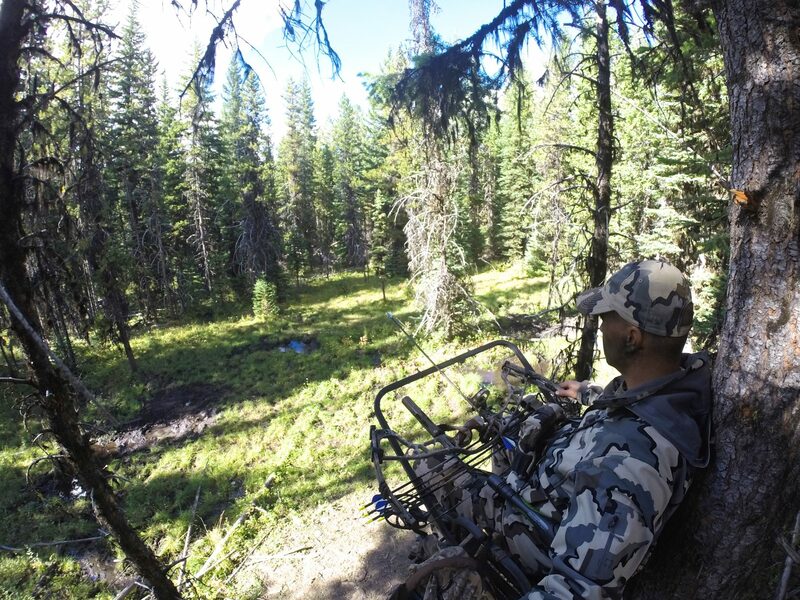 The tree stand will provide you with all the comfort and safety you need to sit for hours on end. With all of the incredible features that Summit has put into this tree stand to set it apart from the rest, you will have great hunting experience.